In the first installment I told you about the Meopta M-RAD 3 MOA sight, which is what originally attracted me to the line of rifle sights from Meopta Sports Optics. For a red dot sight it’s great: rugged, reliable, holds zero. (I keep mentioning the “holds zero” part only because I’ve used some red dots which wouldn’t!) 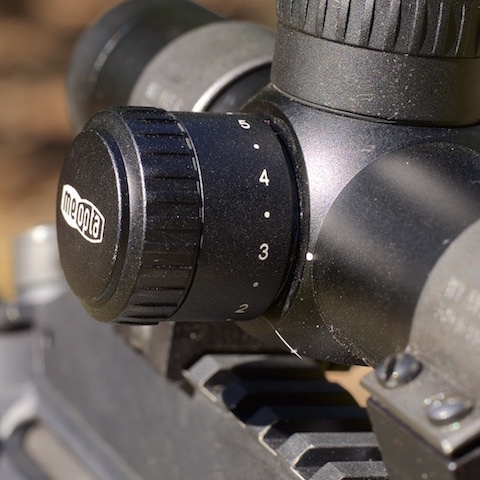 This review will cover their MeoTac 1-4×22 RD tactical scope and how it differs from the M-RAD. The problem with the electronic red dot sight, and this is regardless of manufacturer or model, comes when you have vision issues — especially astigmatism — like I do: the red dot “blooms”, or gets larger with indistinct edges. Most of the time the blooming also results in a misshapen dot; in my case they end up looking like a figure-eight. This can make using a red dot a frustrating, imprecise, and sometimes headache-inducing affair. I want to be absolutely clear: for anyone with those vision issues, this happens with all electronic red dot sights. I also want to make it clear that I knew this going in; this is not my first rodeo, as we say out west! At the same time I also recognized that my eyes aren’t getting any younger and I needed some sort of optical sight, yet didn’t really want a magnified optic if I could avoid it. I’d thus resigned myself to learning to deal with the issues of the red dot and my eyesight. Thankfully the M-RAD was easier to deal with than most red dots; I didn’t experience quite as much blooming and the dot was more symmetrical than others I’ve used, but it’s still a red dot and I still wear glasses! 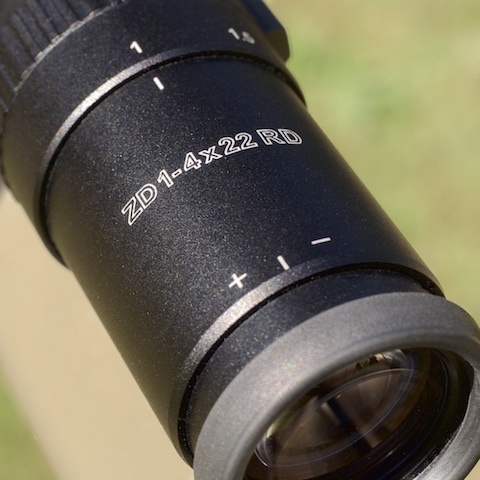 It was fortuitous, however, that the folks at Meopta had shown me another product in their line and it’s the subject of this review: the MeoTac 1-4×22 RD scope. You deserve to know up front that it’s going to be difficult for me to review this optic without sounding like a fawning fanboy, because I really like the thing. I therefore make no pretense about this being a completely unbiased review; it is objective only in the sense that I’m going to report honestly about how it works for a real person with real needs! My teaching and training interest, as I’ve said many times, is in using the rifle as a self defense tool for those occasions where its precision, power and/or reach are important to the resolution of an incident. In the private sector this usually means close to medium distances — say, room length (perhaps 25-30 feet, unless you live in a mansion) out to what I refer to as “perimeter defense”, which might be 100 yards or so. (Perimeter defense isn’t just against criminals; it can also be against predatory or rabid animals, and shots at longer ranges are not uncommon.) 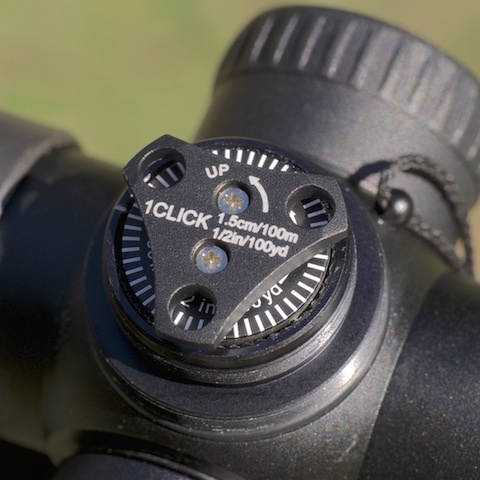 At those widely varying distances I’ve found that a zero-magnification or “1x” optic, such as a red dot, is a great choice; it’s much easier to use at close distances than any sort of magnified optic but can still be used at extended ranges. Anyone who was raised on iron sights, as I was, will have no problem using a 1x optic at 100 yards! The MeoTac scope answers that very nicely by having a true 1x magnification at the low end. Many scopes which are marked “1x” aren’t really; they’re close, mind you, but not quite truly zero magnification. That makes using them in close quarters, with both eyes open, a little more difficult and a little slower than, say, a red dot with true zero magnification. The MeoTac really is 1x at the “1x” mark which makes it an ideal sight for reactive use at short distances. Now there are a couple of competing scopes on the market which also feature 1-4x ranges with true 1x settings, but Meopta got theirs right in one very important way: their reticle. It’s etched on glass (very rugged) and as a result they could make it with any configuration they wanted. What they chose was perfect for an all-around optic — a round dot in the very center flanked by two short horizontal lines with some very small chevrons underneath and pointing up at the dot. No extra stuff to clutter up the view and get in the way of seeing the target, but enough to quickly acquire and fire. It’s a balancing act, and most of the scopes I’ve used were either too much or too little. Meopta’s is “just right” for the tasks I ask it to do. They also added illumination to the reticle, controlled by a knob on the left side of the scope. The red illumination can be set from barely visible to surface-of-the-sun bright and any point in between. This is where careful reticle design really pays off, because a reticle with too many or too large elements quickly overwhelms one’s vision once the light is switched on. With the Meopta, you get a nice red dot in the center and just enough extra to be useful at longer ranges without becoming distracting. The combination of 1x magnification, reticle design and illumination gives you most of the functions of a red-dot sight without the blooming problems associated with a projected electronic reticle. The true 1x magnification makes it fast on target like a red dot should be and easily suffices for those short-range self defense scenarios I described. 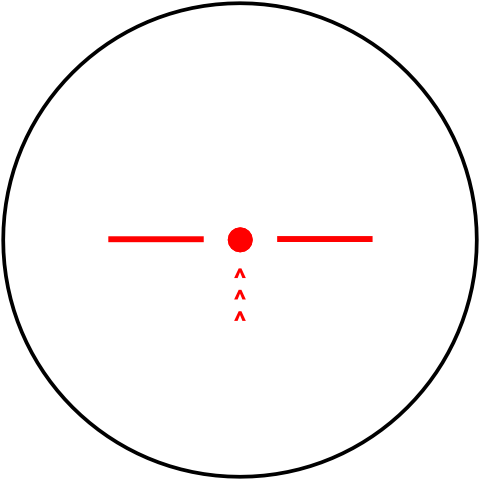 The reticle is in the second focal plane, which means that it shrinks relative to the target as the magnification is increased. (In reality the dot is the same size, but because the image gets larger the reticle appears smaller.) The manual says the center dot covers 2 MOA at the “4x” magnification setting, which squares nicely with my measurements; at the 1x setting it measures just under 7 MOA, though it doesn’t look any bigger than a 5 MOA red dot. I suspect the sharp, well defined edges of the MeoTac’s dot simply makes it look smaller than the somewhat indistinct lines of the projected red dot, though that’s just a supposition on my part. In both cases I found the dot to be more than adequate in terms of the precision potential and never wished for anything smaller. In terms of maximum magnification I’ve found 4x to be more than enough for anything out to about 400 yards. My hunting rifles generally carry fixed 4x scopes; when using a rifle with a typical 3-9x scope, I always leave it on 3x and haven’t yet encountered quarry that needed any more. For any defensive or protective role where enhanced precision beyond 1x is needed, 4x should prove more than sufficient for the task at hand. I can’t think of any plausible circumstance where it wouldn’t. There is one big difference between the MeoTac and any electronic red dot sight, even Meopta’s superb M-RAD: the view through the optic is brighter and clearer. There is no tint and no degradation in the image whatsoever. When you swing the MeoTac up to your eye you cannot tell a difference between what you see through the scope and what you see with your naked vision. It is sharp, bright, contrasty — everything you expect from a quality scope, which it is. The optical quality is impressive in another way: even with a true 1x magnification you can still have optical artifacts simply because you’re looking through curved lens surfaces and the light rays are being refracted through those elements. The result is often some rectilinear distortion, which gives a “rolling ball” effect as the scope is moved around a scene. The closer to the viewer that scene is, the worse the rolling effect can be; it’s not possible to get rid of it completely, but some scopes are better than others. Of the competing scopes I’ve tried the Meopta is the best controlled; rolling is minimal even at fairly close distances. I’m fairly sensitive to the effect and found the MeoTac to be well enough controlled that I didn’t notice it unless I actually looked. That’s an impressive bit of optical engineering! One of my favorite tests for scope quality is to peer into the woods at dusk. You’d be surprised how much difference in performance there is between, say, a $500 scope and a $3,000 scope; the latter will show far more detail in deep shadows than the cheaper scope will. In this regard the MeoTac turned in a very respectable performance, beating an IOR Valdada 2.5-10×42 Tactical scope when both were set to 4x magnification. The IOR’s street price is about $300 more than the MeoTac which puts them in roughly the same price class. One of the reasons I like the MeoTac 1-4×22 as a defensive rifle scope over a red dot is the redundancy factor. In recent years it’s become all the rage to have backup iron sights (aka BUIS) on rifles “in case” something happens to the primary optics. When the Steyr AUG was first introduced in the mid-70s, it was unique in that it had a built-in optic with virtually no provision for iron sights. (I say “virtually” only because there was a crude post and notch cast into the scope housing, which proved nearly unusable and was eventually deleted.) It was also criticized by people who wondered “what will the soldier do if his scope gets damaged?” Oddly, in days prior no one ever asked what a soldier would do if his iron sights got damaged as there were no backup sights at all! I think it’s safe to say that well made optical sights like those on the AUG have proven to be at least as durable as the irons they replaced, and that anything with substantial enough force to render the scope completely unusable would either render the rifle likewise or kill the man holding it. The need for backup sights is, in most cases, overblown. Well, that certainly would be the case if the electronic red dot sight hadn’t come along when it did! While the physical construction of the current red dot sights is generally pretty good, and the enclosed style in particular can take a heck of a beating, what has proven to be less durable are the electronics. Dead batteries aside, all kinds of things can happen to the electronics and stop the dot from being projected; no dot, no sight, and it happens with some frequency. That’s why the last decade has seen backup sights become de rigueur for any “serious” rifle. With the MeoTac I get the advantages of a red dot sight along with built-in redundancy: if the electronics should fail, I still have a perfectly usable black dot and reticle! This makes it ideal for a rifle like the bullpup which has precious little room for back-up iron sights in the first place. Since the MeoTac is at its heart a well-built standard optical sight I’m confident that it will hold up like most quality optical sights have, which is to say I’ll probably die before it will! There are only two things I dislike about this scope. First is the weight; it’s a heavy thing at 19 ounces, as there is a lot of glass inside in order to get everything from 1x to 4x and do so cleanly. It’s also built like small battleship, which makes it rugged in the extreme, but I still wish it weighed less than it does. Then again I wish I could buy a new Ferrari for $10,000 too; in other words, there is no such thing as a free lunch. If making it weigh less meant that it would become less durable, I’d rather just deal with the weight. I’d still complain about it, though! The second is going to sound petty in the extreme, but it annoys me nonetheless: the retaining cords which hold the caps when they’re unscrewed are cheap nylon string. The cord for the top cap broke the second day I had the scope and I hadn’t even abused it yet! For a product of this quality I really expect to see thin stainless cables instead of mere string. It makes absolutely no difference in the operation of the scope, and I haven’t had to remove those caps since I zeroed the thing, but that flopping string still bugs me. As I said, it’s petty — but it does detract just a bit from what is otherwise a high quality package. Street price of the MeoTac 1-4×22 is in the mid-$900 range. Folks who buy their optics in blister packages will think that’s insanely expensive for a low-magnification scope, while those who are used to shelling out the dough for Schmidt & Bender products will sniff that it’s a “bargain basement” product. In reality it’s squarely in the “mid-priced” scope range; when you look at the optical quality and how well it’s built, it’s a good deal. Its closest competition is about the same price but with inferior reticle designs and optical quality; the better scopes are three times its cost and without true 1x magnification. The MeoTac 1-422 truly stands alone. Even though I’m the biggest cheapskate you’re likely to meet, at that price I consider it a bargain given its feature set and performance. As I said at the outset: it’s hard for me to be terribly objective (get it?) about this scope. As my eyeglass prescription continues to change I’ve been looking for a sighting solution that would give me the close range speed, distance precision, durability and redundancy I need. It’s a tall order, and in search of the perfect product I’ve looked at and tried a lot of optics from red dots to reflex sights to all manner of tactical scopes. I’ve told more than one person that I’d stick with my iron sights forever because I didn’t like any of the optics I’d tried; this is the first one that does exactly what I want it to do and the first to change my mind about always using irons. Even my wife, a competent handgunner but a hesitant rifle shooter (and like me an eyeglass wearer), says it’s the first scope she’s felt confident with. That, folks, is an endorsement. I think it’s important to remember that this isn’t a rash judgment or the opinion of some dilettante. I’m an optical snob from way back in my photography days, I know my way around a rifle, and as I write this I’ve been using the scope for nine months. I know it pretty darned well now and it continues to impress me every single time I use it. To say that I like the MeoTac is an understatement; I love the thing, and am even now saving my pennies so that I can afford to equip several rifles. When my parsimonious fingers pry open my wallet and dole out my own money you can believe it’s because I’ve found something truly worthy. The MeoTac 1-4×22 RD is. Hey Buddy!, I found this information for you: "Meopta Optics, Part 2: the MeoTac 1-4×22 RD tactical scope". Here is the website link: http://www.grantcunningham.com/2015/10/meopta-optics-part-2-the-meotac-1-4x22-rd-scope/. Thank you.